Picture courtesy of Peter Loy (www.peterloy.com). 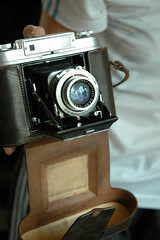 Mine Six is the name of a series of 6×6 folding rangefinder cameras produced by Takane Kōgaku in the 1950s. All share the same body, based on that for the Mihama Six, and all have a unit-focussed 75mm f/3.5 lens. The first Mine Six, released in March 1955, was a major upgrade by Takane of the Sisley 1. The lens was now a Nittō Kominar (four elements in three groups), and the shutter a Rectus with speeds of 1–200 and B. It still had two windows for film numbers; the frame size (6×6 or 6×4.5) was selected via two masks, one for the film and the other (via a lever on the front of the camera) for the finder. The Mine Six IIF, introduced in mid-1955, with an S-Kominar lens, was the first to have a coupled rangefinder. It was advertised in the August 1955 issue of Asahi Camera with a Rectus shutter (synchronized, B, 1–200) for ¥13,000, including case. It has also been observed with a Rectus shutter with a top speed of 300. A leaflet advertising the IIF gives the top speed as 200 and lists as the sales points its high-quality lens (coated on all surfaces), Prontor-type shutter, and strong diecast body; it adds that there is a three-month warranty. The IIF was followed toward the end of 1956 by what was referred to as, successively, the Mine Six IIF改 (pronounced kai and meaning "revised"), the Mine Six IIFb and in the end simply the Mine Six IIF. (Probably all were engraved simply as "IIF".) 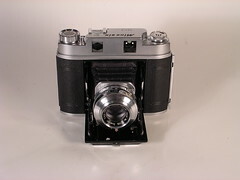 This had an upgraded shutter (a Copal, with B, 1–300 speeds) and lens: an Asahi T-Takumar, advertised and widely reported as having four elements in three groups but actually a triplet very similar in design to the Promar SII that Asahi had made for the Semi Minolta P.
Mine Six IIF no.59662, Copal shutter, Deep-C Anastigmat 75mm f/3.5 lens no.25329. The Mine Six IIF was also sold with a Deep-C Anastigmat lens (as was supplied with the Sisley 1, but unit-focussed). This combination of (a) a "no-name" lens with (b) unit focusing and a Copal shutter having speeds up to 300 seems surprising. No advertisement has yet been noted for this camera — or for the very similar Sisley 2A (see below) — and it is not mentioned either in the regular reference works or in Hagiya's detailed history of Takane. The Mine Six IIISB (or IIIS, also advertised as the Super Mine Six), released slightly earlier in mid or late 1956, was a more ambitious design, having a brighter viewfinder with framelines (although no adjustment for parallax) and semi-automatic film advance: there was no red window on the back, and instead the film was wound between each frame until stopped by an internal counting system. 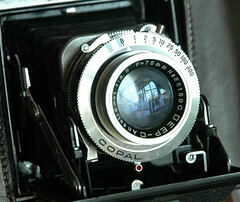 The shutter was now a Copal MFX (with a reversed 300–1, B speed range). A variant of this camera, intended for export, was released slightly later and has a lever for film advance; this variant was consistently termed "IIIS" and the knob-wound variant termed "IIISB" to distinguish it from the lever-wound version, which was also available by special order within Japan. Most, perhaps all examples of both variants are engraved simply "IIIS". Takane wanted to be able to advertise the camera as having a Zunow lens, but Zunow had no experience of designing lenses for quite this purpose. The solution was a three-way arrangement among Takane, Zunow, and Ōfuna: the designer of the 75mm f/3.5 lens for the Ofunaflex (1953) and slightly later Ofuna Six had recently moved from Ōfuna to Zunow, so this earlier design was used for the Zunow "Zuminor" lens. A by-product of this arrangement was that some Mine Six IIF bodies were equipped with Ofunar lenses and rebadged Ofuna Six, for export by the distributor Kashimura (see Ofuna Six). Thanks to the semi-automated film advance, the IIIS(B) can only be used for 6×6; 6×4.5 is not an option. The IIISB was advertised in the November 1956 issue of Asahi Camera for ¥14,950; in the same advertisement was the IIFb, for ¥13,500. As the IIFb postdated the IIISB, would have been less appealing, and was priced only slightly lower, it seems a surprisingly retrograde step. Perhaps the supply of Zunow–Ōfuna lenses could not keep up with the demand for the Mine Six, or perhaps there was a strong demand for the ability to use 4.5×6 — but both of these are mere guesses. The Sisley 2A appears to be a name variant of the Mine Six IIF with a Deep-C lens. McKeown also mentions a Sisley 3A, which looks like a Mine Six IIIS. Neither the Sisley 2A or the Sisley 3A is mentioned in any Japanese source yet seen. It seems likely that these were Mine Six models for export only, perhaps for some distributor(s) who worried about the connotations — subsidence, explosions, drowning, pneumoconiosis, etc. — of the (irrelevant) English word mine. Takane's final Mine Six, released around September 1957, was the Mine Six Super 66. It was a first for Japan and a rarity anywhere: a folder with built-in exposure meter. Moreover, the meter was coupled to both aperture and shutter speed: the user would set one and adjust the other until the two needles matched in the meter display. The lens was again an Asahi T-Takumar. Film was inserted on the right and was wound to the left: the less common direction and the opposite way around from that of the earlier models of Mine Six. The "semi-automation" of the film advance of the IIIS(B) was dropped: film winding again depended on a red window at the back, which in turn allowed the use of 4.5×6 as well as 6×6 format. The name appears on the top of the Super 66 without a space ("MINESIX"), and thus the camera is sometimes referred to in this way. The Super 66 was advertised in the September 1957 issue of Asahi Camera for ¥15,000. Mine Six Super 66, Asahi T-Takumar 7.5cm f/3.5 lens no.22520. "Mine" (ミネ) is an alternative reading of the second character in the name Takane (高嶺). It means "peak" or "summit" (cf "Zenit" and "Olympus"). It does not rhyme with "pine" but instead is pronounced as in "Minervois" (the wine), or more or less rhyming with "spinet". ↑ Asahi Camera August 1955, p. 141. This advertisement describes the S-Kominar lens as four-element. ↑ According to Yamasaki, who dismantled an example for cleaning. ↑ An example was directly observed in Tokyo by Camerapedia contributor Hoary in June 2006. This was offered for sale together with an instruction manual in English only (a manual that incidentally named the manufacturer as "Takane Kōgaku" rather than "Takane Optical" or similar). A second example — body number 55907, lens number 20284 — was auctioned by LP Foto (in Stockholm) in 2003 in the auction of November 20th 2003, objektnr.53. Yet others have appeared in other internet auctions, one of which is pictured in this page. ↑ Hagiya, p.167 of Sengo kokusan kamera jū monogatari. ↑ The advertisement is that for items 1619 and 1620, Kokusan kamera no rekishi, p.296. This advertisement appeared in the photogravure section of Asahi Camera. An advertisement in the issue one month later (reproduced by Hagiya, "Mine Shikkusu", p.138) was for the newsprint section, requiring a redesign; this has the prices the other way around: IIISB, ¥13,500; "IIF" (equipped with Takumar lens), ¥14,950. The pricing here was surely a mistake, as even in this advertisement the IIISB is presented as the more advanced and glamorous alternative. Advertisement for IIF. 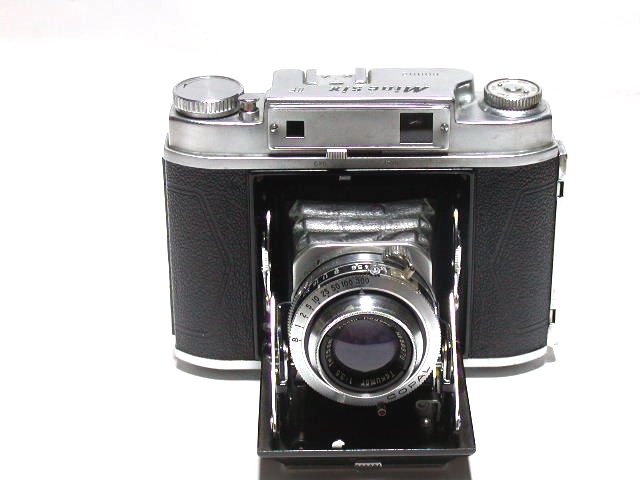 Asahi Camera August 1955. P. 141. Asahi Camera (アサヒカメラ) editorial staff. Shōwa 10–40nen kōkoku ni miru kokusan kamera no rekishi (昭和10–40年広告にみる国産カメラの歴史, Japanese camera history as seen in advertisements, 1935–1965). Tokyo: Asahi Shinbunsha, 1994. ISBN 4-02-330312-7. Items 912–3, 1619–21. Hagiya Takeshi (萩谷剛). "Mine Shikkusu: Gunma-ken Takasaki-shi no kameramēkā" (ミネシックス：群馬県高崎市のカメラメーカー, Mine Six: A camera-maker in Takasaki, Gunma). Chapter 7 of Zunō kamera tanjō: Sengo kokusan kamera jū monogatari (ズノーカメラ誕生：戦後国産カメラ10物語, The birth of the Zunow camera: Ten stories of postwar Japanese camera makers). Tokyo: Asahi Sonorama, 1999. ISBN 4-257-12023-1. This history of Takane is based on Hagiya's interviews with four people who had been key figures in the company. "Naigai kamera nyūsu" (内外カメラニュース, Domestic and imported camera news). Sankei Camera September 1956. Pp. 171–6. A listing of the month's new products; the (knobwound) IIIS appears on pp. 172–3. Nakamura Fumio (中村文夫). "Tsuzuki: Supuringu kamera de ikō: Mine shikkusu" (続・スプリングカメラでいこう：ミネシックス, Let's use folders [continued]: The Mine Six). Shashin Kōgyō (写真工業), March 2003. Pp. 11–13. About Asahi Kōgaku and the Mine Six IIFb. Takane Kōgaku. Leaflet advertising the Mine Six IIF. "Takane Minesix Super 66." Spotmatic: Trimestrale dell'Asahi Optical Historical Club, no.38, October 2003. Yamasaki Kuniomi (山前邦臣). "Kokusan yuitsu no roshutsukei naizō 6×6 han supuringu kamera: Mine Shikkusu Sūpā 66" (国産唯一の露出計内蔵6×6判スプリングカメラ：ミネシックス・スーパー66, Japan's only 6×6 folding camera with built-in exposure meter: The Mine Six Super 66). Kamera rebyū: Kurashikku kamera senka (カメラレビュー・クラシックカメラ専科), no. 56 (September 2000), pp. 26–7. Takane Minesix Super 66: A scandalously good "forgotten" folder by Anthony, aka antjam65, at his photo website．Also a user of some very prestigious alternatives to the Super 66, Anthony says of it: "On every level I can think of (build quality, ease of use, optical quality, styling...) this camera equals or exceeds any folder I've used." Mine Six IIF, lot no. 53 of LP Foto auction no. 19 (November 2003). This IIF is the obscure variant with the "Deep-C" lens. This page was last edited on 9 February 2018, at 11:33.